myoldmac.net - Link Puzzler in original box - Rubiks Clone - Buy It ! This puzzle consists of a square tower of four layers. 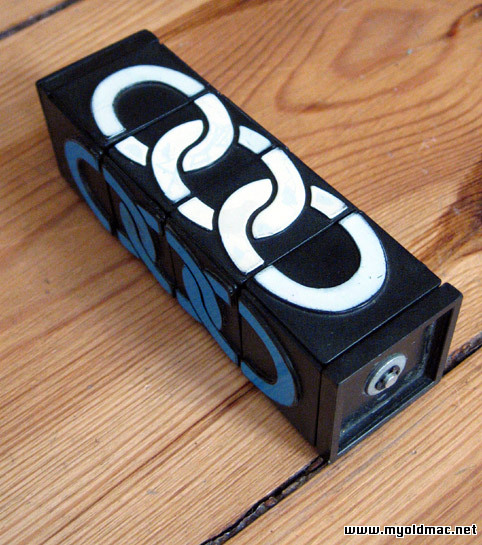 On the sides are sliding tiles, and each side depicts a chain in different colour. One chain, the white one, is made of only three tiles, so that there is a gap. The tiles can slide up and down into the gap. The top and the bottom layer can rotate so that the pieces from different chains are mixed up. The objective is to mix up the puzzle and then return it to ts original state. The puzzle is made of thick plastic and measures 12.5cm long by 4 cm squared. The patent for the Missing Link is US 4,373,729, filed 12 Jan 1981, granted 15 Feb 1983, held by Marvin Glass & Associates. The inventors are Steven P. Hanson and Jeffrey D. Breslow. Ein seltener Link Puzzler mit den Farben: Gold, Weiß, Blau, Rot. In gelößtem Zustand, aber mit sichtbaren Gebrauchstspuren. Cube - Tangle - Signed Master Cube - Clock - Babylon Tower - Link Puzzler und mehr!